Said it before, and now I'm saying it again...with both Barry and Roger caught in lies about steroids this week—and both out of work despite neither having officially retired—I'd like to thank ESPN's Jemele Hill, the Reverend Al Sharpton and everyone else who said the steroid investigation was all about race. If there is a silver lining to this horrible chapter in baseball, it's that people who were trying to use the steriod scandal for their own purposes and foment idiocy are being revealed for the talentless fakes they are. OK, on to actual sports. Firstly, Jeff Weaver...do whatever you can to get back to St. Louis and pitching coach Dave Duncan. I'm speaking from the heart here, Jeff. 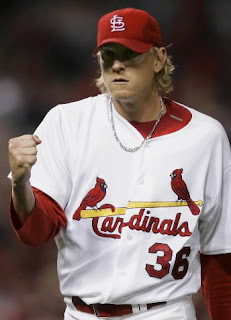 Since the catastrophic trade to the Yankees and the meltdown thereafter, Jeff, the only time you've looked confident on the mound has been in the postseason in the Cards uniform. So Jeff, do whatever you have to, but get back to that pitching coach, the one that gave you peace of mind on the mound. Does anyone else really believe this whole Randy Moss free agency circus? For god's sake, both sides already, agree to a deal. You both know you will eventually. Randy, you won't play well anywhere else. And Patriots, Tom Brady will kill you guys if you let Randy go anywhere else. So stop being stupid and get this done. Despite what some reporters believe (I'm looking at you Cnnsi.com), Pro Football Weekly says most scouts feel this is a one-QB draft. "There’s not much there after Matt Ryan." And with next year's draft shaping up to be one of the worst in draft history, some QB starved teams might get desperate and trade up to get BC's Ryan. You gotta love the Raiders. They pinch pennies for their no 1. draft pick last year, so he misses the preseason and part of the regular season, and they go toe-to-toe with every coach they hire, but they drop 50.5 million on a DT who tore an ACL last year. And before he got injured, he had one sack last year in 7 games. That's right, one. Nice, Raiders. That's the way to run a NFL organization. Hey, wait a minute. What the heck is Jacksonville doing trading Marcus Stroud to Buffalo? And for practically nothing—third and fifth rounders? What the heck? Stroud was the better half of an awesome defensive line tandem with John Henderson. Together, Jacksonville had a young, dominant DT tandem. And since good DTs are so hard to find, why would you trade them. And really, Stroud is a beast. A massive 6-6, 310-lb.run-stuffer, he is going to free up uber-sack artist Aaron Strobel to do what he does. And what's even weirder about this, is that no one seems to be talking about it. Personally, I think the Stroud trade is one of the better moves this off-season. Bravo, Buffalo. Saw some baseball this weekend, and boy was it great to watch. All except one thing. Kei Igawa. Wow, did he look like he caught a case of the "CantPitchNoMores". 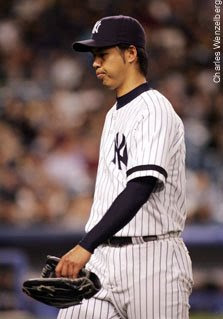 While the rest of the Yankee pitching staff relaxed and pitched well against the university of South Florida, only giving up one hit between them, Igawa walked two, hit another, then served up a grand slam. Yikes. Any way we could trade him back to Japan for...anything? A box of Krispy Kreme? Without sprinkles? Hello? Japan? I read Igawa finally pitched well yesterday. We can only hope that he'll do a decent job this year. You're right, Paul - I think Buffalo swindled the Jags. It looks like Buffalo's D will be a tough unit again. Adding an All-Pro defensive tackle can't hurt. Yeah, I am still a little baffled at the Stroud trade. A three and five don't seem like much for an All-Pro DT. Truly weird.